Crossing Worlds is the second book in The Rise of the Aztecs series and consolidates Zoe Saadia’s skill as the creator of a world that is both thrilling and believable. A world in which readers can fully immerse themselves. 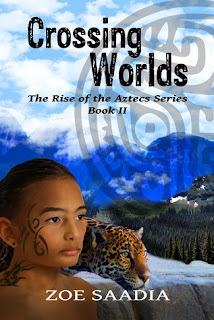 Crossing Worlds picks up the story of Kuini and Coyotl, two years on from The Highlander. The boys are now seventeen years old and have honed their skills as warriors whilst battling the Tepanecs, who have invaded Coyotl’s homeland and killed his Emperor father. Exiled from the Lowlands, Coyotl is forced to take refuge with Kuini’s estranged family in the Highlands. Much as I enjoyed The Highlander, I enjoyed Crossing Worlds even more. I suppose this is inevitable as we get to know the characters and their stories more fully. Kuini and Coyotl are as different as can be and should be natural enemies and yet their friendship is deep and enduring. Ironically, both of them seem to have been born into the wrong world as Kuini loves the life of a warrior which is more in keeping with the Lowlands, while Coyotl prefers the gentle pace of life of the Highlands. Unfortunately, neither has the luxury of choosing their own destiny as events conspire to dictate their choices. Saadia’s love of history is once again clearly demonstrated as she highlights the politics, not only between the different communities but within Kuini’s village, where his war leader father faces attacks on his position from all sides. At the same time, he is trying to encourage a new alliance with their traditional enemy the Lowlanders, in order to stand up to the more aggressive and powerful Tepanecs. One of the themes I particularly enjoyed is the way Saadia explores the dynamic between father and son. Kuini left his village after discovering his father’s heritage but during the course of the novel he is forced to acknowledge that he misjudged him. Kuini’s father stands by his son in the face of much criticism about his friendship with a Lowlander. He recognises his son’s potential as a warrior and leader and sees a lot of himself in Kuini. I also liked the way that Saadia develops the representation of women in a very male dominated world. Kuini’s mother is the main priestess and a great healer but she has to publically defer to men, even though in private her husband respects and listens to her opinions. I loved the character of Dehe, a strong independent girl who, shunned by the villagers, lives by herself in the woods. Dehe, like Kuini’s mother is a great healer and Saadia hints at her potential to play an important role in the future stories. Saadia ends her novel at the point where Kuini, Coyotl and Dehe are about to leave the Highlands and ensures that we are desperate to follow their adventures in the next instalment. Saadia’s prowess as a writer is clear in the way she captures and maintains our interest with the twists and turns of the plot. At the same time, however, she provides a very human face to this period in history ensuring that we engage with the events and the implications they have on many lives. If you like a series in which you can become fully absorbed then I recommend this one wholeheartedly. Crossing Worlds could be enjoyed as a standalone but nothing beats reading the series in order to fully get to know the characters. Meanwhile, I can’t wait to read The Emperor’s Second Wife, which is the next book in the series. Fantastic review :-) Can’t wait to get further into this series.